So much more than just billboards, Billboard can scale and justify almost any text with style. Please see the Live Demo site above which has detailed usage instructions. Billboard is a lot more than glitzy posters. Use it in your normal content to have perfectly auto scaling column headers. 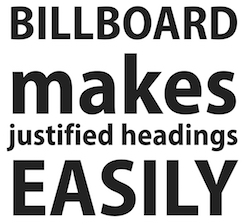 Billboard enhanced autoscaling headings, paragraphs and text in any theme. Autoscale - Scale just one line or an entire paragraph to fit in a fully justified manner. Create beautiful panels and announcements. Google Fonts & Custom Fonts - Apply Google fonts or your own custom fonts (EOT, TTF, WOF, SVG) to your text, independent of Foundation settings and preview it live in edit mode. Font Vault Support - for use with Font Pro. Opacity Text - Apply an opacity to your text, ideal when placed over images and cover backgrounds. Fade In - Soften the page appearance with a very subtle fade in of your text.